These armed Filipino soldiers are from the town of Macabebe in the Province of Pampanga. And soldiers just like these, if not some of these men themselves in this photo, once lived in Saipan for about half a year. Older people in Saipan used to talk about the tiempon Macabebe (the Macabebe times) and how bad it was! But while the Macabebe soldiers lived in Saipan, with their wives and children, they had other children, born and baptized in Saipan. A list of these Macabebe babies born and baptized in Saipan follows this story. But first the story. How did these babies of Macabebe parents manage to be born on Saipan in 1899? 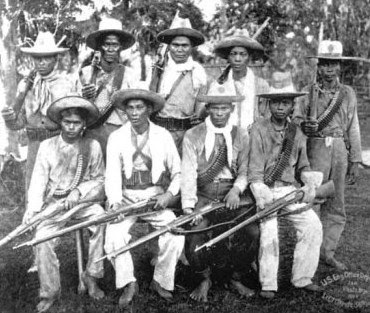 Armed struggle broke out in the Philippines in August of 1896 between Philippine independence fighters and the Spaniards. In the town of Macabebe in the province of Pampanga, a Spanish-Filipino mestizo named Eugenio Blanco y Leison eventually organized a group of volunteer fighters to defend the Spanish cause. These Macabebe volunteers remained loyal to Spain even as the war went badly for Spain. The American entry into the Philippines in the summer of 1898 made Spain's chances of hanging on to the Philippines even worse. By the end of the year, the Macabebe soldiers were wondering what to do next, since the Philippines seemed sure to fall into either American hands or an independent Philippines. Blanco and his soldiers, plus wives and children, some 700 people altogether, set sail for Saipan, still in Spanish hands in early 1899. They stayed in Saipan until the Germans came to take over the Northern Marianas in November of 1899. But for those six or seven months in 1899, pregnant Macabebe women gave birth to their children in Saipan. Here is the list, compiled from the Saipan baptism records. That makes 14 Macabebe babies born and baptized on Saipan; 8 girls and 6 boys. Interestingly, even though history tells us that there was great tension between the Macabebes and the Saipan Chamorros and Carolinians, we find that one Macabebe baby had Chamorro godparents. José Alig and his sister Lucía Alig were godparents for José Bautista e Ysi. Even more interesting to me is that Juan Reyes, a Chamorro, asked Pedro Mansale from Macabebe to be godfather to his son Pedro. Why more interesting? Because there was no shortage of Chamorro candidates to become godfather, but the father chose a Macabebe. So, relations may not have been so strained for everyone, all the time. Pedro Mansale must have been rather popular because he was godfather a second time for another Chamorro baby, this time José, son of Juan Cabrera. Adriano Bongay and his wife Francisca Díaz of Macabebe were godparents for the Chamorro baby Adriano, son of Juan Castro. The Macabebe contingency under Eugenio Blanco numbered some 700 persons, which undoubtedly included Filipinos from places other than Macabebe who were loyal to Spain. Some of these also acted as godparents for Chamorro babies while they lived in Saipan. Enrique Montealegre and his wife Felisa Bernardino from Santa Cruz, Zambales were the godparents of the Chamorro Enrique Bernardo Fausto de Salas. MAGELLAN : WAS IT REALLY HUMÅTAK?